Often times my diet will change based on what I'm trying to accomplish with my body. To put it simply, I come up with “systems” that keep me on point and moving forward in the right direction on a consistent basis. There are a number of ways to diet and train and sometimes it just takes coming up with a system that you can stay consistent with. Consistency is what prevails over anything. The daily regimen of eating clean and sticking to the gym grind month after month and year after year is going to produce more results than ANYTHING you could take!! Some genetically blessed individuals can progress faster than most, but that isn't the case for the majority of people, including myself. I'd say the first 10-12 years of my weight training was simply pushing and hoisting weights. I hadn't developed the same mind-frame that I have now, and I'm not quite sure if it's something you can actually develop without the experience. In the past I usually did what most guys commonly do and that's bulk up, cut down, bulk up again and cut down again. It was a given that when I bulked up I'd pretty much neglect direct ab training and cardio, and when it was time to cut up I'd neglect strength levels as I dropped more and more body-fat. So although I had developed systems for building and cutting, they were usually short term approaches that flipped one way or the other like a light switch!! The difference between how I approached things then versus now is that I didn't walk that fine line between being able to build up or shred up as quickly as I can now. Although I'm far beyond my genetic limitations, allow me to explain things more clearly here. Back in the day I'd have to lose a ton of body-fat to see the same level of conditioning and hardness that I can achieve in just a few weeks now. I also spent more time eating and gaining mass back then, so although I would carry up to 30 lbs more weight than I do nowadays, it was mostly bloat and fat!! I eventually got to a point where it just wasn't worth gaining all of that weight in order to push just a little more weight on a bar. At my heaviest (263 lbs @ 5'9) I could do a set of barbell squats with 405 lbs for 23 reps. Now I could probably hit 15 reps on a good day. My physique now is way beyond what it used to be though. Before you get the wrong idea about diet and training I DO want to make 1 thing very clear here; you need progressive resistance your first few years in the gym!! Progressive resistance is where you continue adding weight to the bar and getting stronger consistently!! I received an email from a reader a few days ago and he was asking me if he should continue to build up, or drop some body-fat first and then build up. 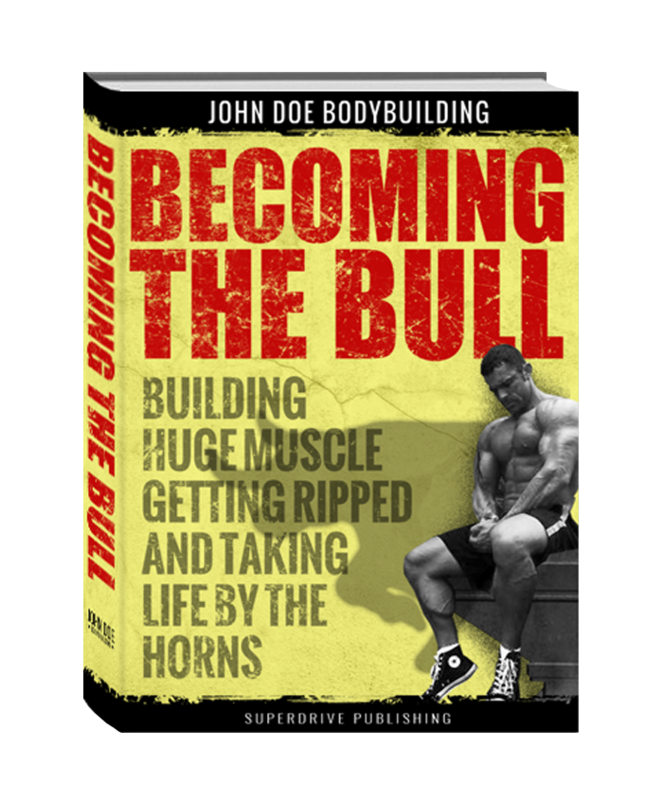 He had just completed the “125 routine” I'd outlined previously, which is an excellent starting phase to build up to a point you can more effectively and safely transition into more traditional weight routines. His question was a great question, because he put on some great size and someone more inexperienced might have told him to start eating in a deficit and lose some fat before building back up. I told him to keep building though. The reason I told him to continue to build and worry about cutting later was based on a few things that a lot of trainers would never take into consideration. First off, there was no reason to start cutting up with a lack of development. While he did in fact gain some great size, it was mostly from body weight exercises and not anything that overloaded him. I told him that if he started cutting up now then he wouldn't be taking advantage of those new gains that would come from his transition into strictly progressive overload training, not to mention the best gains come on when you're new to it all!! Another key factor is the fact that muscle is a fat metabolizer, so you may think you'll gain fat when you keep gaining, but you need to remember that pushing heavier weights burns calories and builds muscle mass. So you may not gain as much fat as you think!! Another thing we want to consider when coming to this fork in the road on whether to keep building or to start dieting, is the question of shoulder/chest/back to waist ratio. Let's say you're 180 lbs with a 36″ waist; why not pack on more muscle so you could eventually be 210 lbs with a 36″ waist? Sure, it may take building and cutting a few times and a process that takes awhile, but eventually what you want is the illusion of a smaller waist due to your upper body being larger. The illusion is what becomes the pinnacle of bodybuilding. Ok, so enough of that for now, I just didn't want to discredit the benefits of progressive overload for newer trainees (or someone who has been out of the gym for awhile and just getting back into it). You see, a lot of what you'll see me talk about is all about conditioning and maintaining a hard look most of the year. I guess that's partially because of where I'm at in my stage of the game (over 20 years of training). So usually I write in what I like to call “REAL TIME.” That is basically where thoughts pop into my head and I think to myself “Yea, guys would want to know about this stuff! !” So I write when I'm motivated and I have something fresh. This is usually late at night or very early in the morning when I'm most creative. Ok, so here we are in real time. 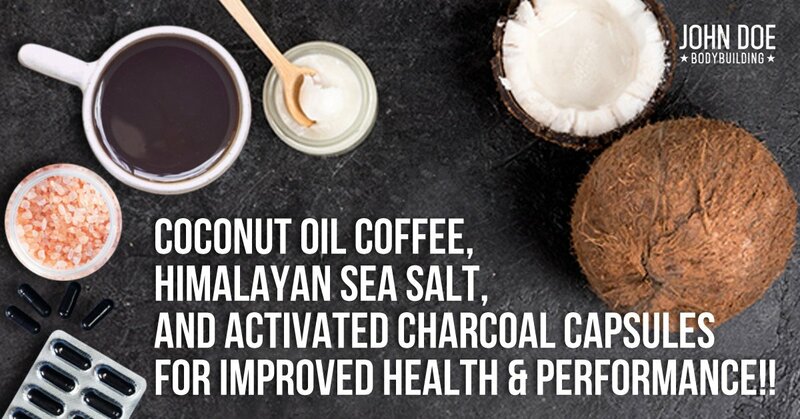 By now you're probably asking yourselves what in the hell any of this has to do with coconut oil coffee, Himalayan sea salt, and activated charcoal capsules. Easy enough, it's just something new I threw into the mix lately after corresponding with a couple people who live the fit lifestyle!! So remember how I was saying that coming up with a “system” is a good way to stay consistent? Well, right now I have dropped carbs back and I usually go around 5-6 days straight on a very low carb intake. I wouldn't be doing this same strategy otherwise because if my carbs were more moderate then I'd keep the fats down instead. But this system is working for me quite well. It's summertime here and sodium is more essential when it's hot outside to help maintain an effective nutrient and electrolyte balance in muscle tissue. That's right… sodium will actually benefit you and help keep you stronger when you naturally lose more water from sweating. So I threw some of this into my diet as of recently. I just sprinkle a little of it on egg whites and over my steamed broccoli, nothing crazy. Ok, what the hell is coconut oil coffee anyways? You take your coffee and mix in one tablespoon of unsalted butter and one tablespoon of coconut oil. You need to blend it all together for a few seconds. It's not going to mix right when you use a spoon, trust me!! I use a nutri-bullet blender myself. Then, simply pour it into your coffee mug. It's going to look the same color as if you added cream, it's frothy on top like a fancy coffee drink from a gourmet coffee shop, and tastes nothing like you'd think!! The reason for adding the fats to the coffee is to create two things; a more time released caffeine since consumed with fats, and an appetite suppressant to get you by a few hours before you feel like you're starving!! It also helps with cognitive function (or so people claim) which would make sense since the fats will be used by the brain for energy rather than a carb-heavy breakfast that could give someone a quick spike and then a rapid drop in energy levels and leave them foggy minded. Right now I'm using the black Sumatra coffee from Red Supplements and it's some high octane stuff with a really good flavor to it!! For the oil I use coconut oil, and remember that the butter needs to be unsalted butter or it might not taste so good. I don't really intermittently fast but I will occasionally wait a couple hours to eat upon awakening. So lately my routine has been the coffee blend, wait a couple hours and then eat 12 egg whites with 1-2 pieces of Ezekial toast (if I feel I need a little carb intake) or 2 tablespoons of flaxseed oil instead (if I feel I can go longer on little carb intake). This is all based on how I look/feel at the time. You too will learn your body as time goes on!! So onto the activated charcoal capsules. Yea I know, it's only used to treat alcohol poisoning or a drug ingestion right? That's what I used to think myself also!! I was talking to a former bodybuilder not long ago and he told me that activated charcoal capsules were a part of his supplement regimen. The 3 biggest reasons for activated charcoal supplementation are to promote a healthy digestive tract by removing toxins in your body (this is also supposed to help alleviate joint pain), it's ability to lower cholesterol (something those on testosterone replacement should consider), and the reduction on bloating. I have a training client who was ABSOLUTELY STUCK at a current body-weight and trying to shed off an additional 10 lbs. I told him to start supplementing his diet with activated charcoal capsules and within a week he busted off another 6 lbs!!! He sent me updated photos and clearly there was abdominal definition that just wasn't there in the previous photos I saw. You shouldn't take activated charcoal capsules without drinking PLENTY OF WATER. They can constipate you if you don't drink enough water. While normally I'm not a guy who measures his water intake on a regular basis I have found that AT LEAST A GALLON PER DAY is needed when I take 2-3 capsules of activated charcoal that day. You also probably don't want to use this every single day. It can dehydrate you if you're not careful, so I'd suggest going 2-3x/week with it. The first week I took it daily, but after that I reduced it to just 2-3x per week. The guy who shared this info with me told me that he noticed that he sweat more on days he took it. So I figured what the hell, maybe I can use this to sharpen up and rid my abdomen of any remaining bloat I might have. So anyways, there you have it in real time. This is what I've been doing lately to help drop some fat and maintain adequate strength levels in the gym, despite a lower carb intake!! I’m currently cutting by using intermittent fasting and a keto diet (super low carb). Regarding the coffee, sometimes called bulletproof coffee, it is a great appetite suppressant and energy stabilizer. As a matter of fact, I’m having to cut down on it because it’s causing me to eat less (and have far less protein) then I should! I use Kerry Gold Irish butter, and also sometimes add heavy cream (almost exclusively fat). Works great while being in a keto state, and/or doing IF. I actually do want to get Himalayan salt due to the minerals, and because in keto anything water soluable gets depleted fast (no carbs=no water retention). And finally, I added the activated charcoal to my amazon supplement wish list. I have a lifting age of 7, and plan to do this for the rest of my life. I”m not concerned with getting ripped and swole in the next 6 months; instead, I more imagine my lifting life as Hugh Jackman’s. Look at him in his first X-men film vs his most recent Wolverine films. He’s progressed steadily over 15+ years in front of our eyes. I would actually be interested in you doing an article on Jackman and other’s who have taken time to progress and think long term!